Go to our list of scholarships for Art and Music, click here. An art program focuses on the individual development of imagination and creative thinking processes through one or more artistic means of expression. It helps students express themselves aesthetically and imaginatively by using the language of visual form and symbolic expression. It encourages creative discovery and provides an understanding of art and artists in an historical context. A major in art is for those who are interested in becoming professional artists, teachers or scholars focusing on artistic media such as painting, sculpture, film studies and photography. Art is an important means for creating and relaying ideas, thereby affecting our culture. Art as a major encompasses many topics. 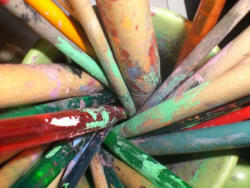 Therefore, there is a wide range of individuals who will enjoy taking art as a major. Artistic individuals are able to draw, paint or design are primary candidates for this major. An art major may also include music, theater, cinema, dance and photography. An art major’s curriculum depends largely on the artist’s medium, although some classes in drawing, art history and design are usually required for all concentrations. Individuals who choose music as a major are in for a field full of diverse styles, methods, cultures, and themes in varying types of music. Virtually any type of musical instrument and ways of playing it can be learned in this major, and the experience is often carried on throughout the major. Vocal music may also be studied for group or individual performances. For the music major, the history, theory, and composition of music that is intended to provide an extensive background in the art form for students who may go on to professional careers as composers, performers, or scholars, or who may enter fields in which a solid grounding in music is essential, such as arts management or publishing. This major is a favorite of people who, obviously, have a love of music, performance, and composition. Music majors are often inquisitive, analytical, observant, they are able to think abstractly, able to draw, and enjoy coordinated activities and sports. Often artistic, this kind of person enjoys various kinds of art like theater, types of artwork, and creative expression. Former US President Ronald Reagan said, “Civilizations are most often remembered for their art and thought.” He went on to say “I have always believed in the definition of an educated man or woman as one who could, if necessary, refound his or her civilization. That means we must teach our students more than hard facts and floppy disks. We must teach them the rich artistic inheritance of our culture and an appreciation of how fine music enriches both the student who studies it, and the society that produces it. The existence of strong music and fine arts curricula are important to keeping the humanities truly humanizing and liberal arts education, truly liberating.” This is even more true for Myanmar. In addition, art and music study promote cultural awareness, which is essential if individuals are to become strong contributors to their society. The greater our investment in our young minds and the more access we provide to our culture, the more likely that society will be repaid in the form of individual accomplishment. Art and music provides an avenue for unparalleled social interaction and growth. It is true that many find art and music more interesting than other subjects. In Myanmar, there is a diverse range of ethnic groups which creates an amazing variety of art and music. If political issues prove difficult to reconcile, it may be that there is an answer through art and music. This may be backed up by the fact that the systematic study of art and music develops higher order thinking skills and contribute to sensitivity. This includes discipline, problem solving, attentiveness, reflection, and curiosity-qualities that animate us as individuals and are represented in cultivated minds. Many academics are also concerned that cultures are being erased. This certainly true in Myanmar as well. There are many things changing culture both inside (modernization) and outside (globalization) Myanmar, and one way to preserve indigenous cultures in Myanmar may be through an interest that everyone has in the arts and music. Art and music makes the day more alive and interesting, which in turn leads to more learning. Art and music also provide a way to imagine and create which contribute to a dynamic society. Art and music enrich life and are a way to understand our cultural heritage as well as other past and present cultures. Art Management exposes students to the highest professional standards in art practice outside its own production. The program provides important interfaces for education and training in such areas as curatorship, exhibition design, and the marketing and promotion of the arts. Art Management graduates are qualified to work in museums and art institutions as curators, exhibition designers and education officers. They work as art critics, art historians, culture and heritage advocates and editors of art, culture and life style publications. They can be publicists and managers of established and up and coming talent or private and public art institutions like museums and galleries. There is a certain mystique to women and men who can move their bodies in amazing and beautiful ways. Dance is as much a part of the world’s artistic history as literature, music, or the visual arts, and its beauty is just as varied and complex. If you’re a Dance major, you’ll study many forms of dance, including ballet, modern, jazz, and various ethnic forms. You will also study Dance as an art—its role in history and its influences on different cultures. Dance is a performance art, and much of your college experience will include performance. You may choose from many concentrations of study as you move toward your degree—choreography or technology, for example. Many students choose to focus their study on Dance Education. Dance majors are usually already devoted to their art, having taken dance classes from a young age. Dance programs are generally competitive, as is the case with most performance programs. Be prepared to submit a videotape of your past performances. You’ll probably also have to give a live audition to be accepted to a Dance program. The Industrial Design Program develops in students the understanding of technologies appropriate to product development, as well as package and systems design towards their proficiency in designing products to be manufactured for mass consumption. The curriculum is designed so that students will learn to tap a wealth of sources, including historical styles, traditional and indigenous crafts, as well as popular trends and high technology in the use of materials and processes to create well-made objects and systems that help improve and enhance the quality of life. Information design is a new field rooted in graphic, space and industrial design, but revitalized with new possibilities because of advances in information technology and communication media. Information design as an emerging discipline blurs the boundaries between advertising, art direction, graphic design, computer-human interactions, information architecture, user interface, design, usability, and cognitive psychology. In short, Information Design involves the presentation of relevant information in an effective design that can be understood by the target audience. Information Design graduates work in advertising, the media, urban planning, publication, and the school setting. They can be freelance artists known for a personal brand of graphic art and design, such as book design, animation, and cartoon art. The interior design major prepares students for the profession of interior design by developing the skills necessary: identity, research, and creatively solve problems pertaining to the function and quality of the interior environment. They perform services related to interior spaces, including programming, design analysis, space planning, and aesthetics, using specialized knowledge of interior construction, building codes, equipment, materials, and furnishings. They also prepare drawings and documents in relation to the design of interior spaces in order to enhance and protect the health, safety, and welfare of the public. Students learn basic architectural principles and how interior spaces function within an architectural context. They also explore the relationships between people and space, as they learn how to design commercial, institutional, recreational and residential facilities. Students develop competency in specific interior design subject areas such as graphic communication, theory, lighting, environmental technology, interior materials, and interior construction systems as they learn how to creatively solve interior design problems. A Bachelor in Music provides a well rounded preparation for a professional career in music revolving around a core of applied and theoretical subjects. Individuals who choose music as a major are in for a field full of diverse styles, methods, cultures, and themes in varying types of music. Virtually any type of musical instrument and ways of playing it can be learned in this major, and the experience is often carried on throughout the major. Vocal music may also be studied for group or individual performances. For the music major, the history, theory, and composition of music that is intended to provide an extensive background in the art form for students who may go on to professional careers as composers, performers, or scholars, or who may enter fields in which a solid grounding in music is essential, such as arts management or publishing. Music Education is designed to prepare qualified musicians as teachers of music in elementary and high schools. The curriculum is planned to develop teachers who have understanding of the classroom implications of the principles of human development and behavior, the nature of the learning process and the procedures for developing classroom strategies and materials. The curriculum includes education subjects, which provide the knowledge, skills and attitudes that are necessary to the effective teaching of music. This major provides the students skills to meet the needs of our contemporary music industry (areas of concentration in creative music writing, scoring, recording and production management for mass media). The program of studies in music production and technology focuses on strengthening the student’s musical skills, which will prepare them for music production. Important features of the programs include a strong foundation in music theory and literature, skill building, and an experiential hands-on type of learning. Painting is known as purely fine arts. It is a program that involved the study of the art of painting or drawing of the human figure, animal figure, inanimate objects and nature, with the purpose of achieving, not only the aesthetics value for appreciation of the human eye but mainly to develop an understanding of aesthetics for better expression and communication. Three-dimensional form in relation to materials, process, and content is the essence of the sculpture program. The curriculum offers courses in varied sculptural media, both traditional and contemporary. The student undergoes training in conceptualization, analysis, and evaluation of artistic concerns. Sculptural interests are explored within the context of idea and their expression. Theater Arts exposes students to the range of theater activities, on stage and offstage all of which require collaboration, intelligence and passion. Some degree of specialization will be expected at the undergraduate level—in acting, directing, or production design—but not as much as expected from a graduate degree program. The program is seen as a way to increase the number of trained women and men to sustain their theater activities in the present and the future, to provide a venue for the training of theater professionals and to prepare students to apply their knowledge of theater craft for work in film, radio and television. Aside from the obvious involvement in theater and media, Theater Arts graduates do well in fields and career that place heavy demands on meeting the public. The program can be a sound undergraduate preparation for one interested in public service or law, in teaching or in sales and business, and fields involving human relations. This major introduces the student to various areas of the visual arts. While providing training in the traditional studio arts, the program also addresses new requirements in fine arts education and the changing demands of the visual arts profession with its courses on electronic media, digital photography and new production methods. The Visual Communication Program develops students to become visual specialists who give form to ideas and information. It is focused on the advancement of the ability to use traditional and up-to-date technologies to create effective advertising, publishing, editorial, corporate, information, website and multi-media design. In addition to skills, equal emphasis is given to concept development and problem -solving necessary to applicable professional pursuits. Art criticism is the study and evaluation of art. Aesthetics or the philosophy of beauty is the core of this program of studies, through which you will learn how to define art and you will practice to use the instruments needed in judging the value a work of art. The prime purpose of this program is to provide highly motivated and committed students with an advanced-level postgraduate education in fashion and textiles, including a chosen area of focus or specialise. The program offers subjects blending areas specific to fashion and textiles technology, and merchandising and supportive knowledge. The Master of Fine Arts has an emphasis on professionally-oriented study and production work. The objective of the program is to promote excellence and to advance learning, knowledge and professionalism in the practice of the arts through research, documentation and production. Upon entering the music graduate programs, students decide on a major in performance (classical piano, voice, choral conducting, string and wind instrument), music education, musicology, and in composition. Later on, they can study a minor area that complements their major field and a set of electives. The core of the program, however, is the music analysis and the music research method courses that equip them with technical tools to perform intelligently, write their musicological and music education theses, and compose with a solid theoretical framework and idea. In addition, students can take up language courses that they can use in their careers as performers, researchers, and as composers. Career options: concert artist, scholar, pedagogue, composer, music teacher and educator.